Yield: Makes one to two jars. 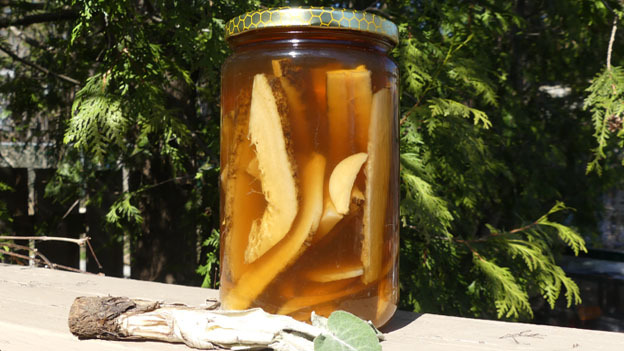 Burdock root pickles are sure to become a family favourite. With the ginger, garlic and organic apple cider vinegar, these pickles pack a nutritional punch. Scrub the roots well to remove any dirt and then remove the outer skin. Cut the roots into 1 to 2 inch long segments, and then thinly slice or julienne them. Place prepared burdock into a pan and just cover with water. Bring the water to a boil for 2-3 minutes (just enough to slightly soften the roots), remove from heat. Remove the roots using a slotted spoon and place them in a clean bowl, reserving the cooking liquid. Add the ginger and garlic to the burdock and mix well. Divide this mixture into 2 or 3 sterilized mason jars, filling them to about one inch from the top. In each jar, fill 1/4 of the volume with apple cider vinegar, 1/4 with fermented soy sauce, and 1/2 with the burdock cooking liquid. Cap tightly. Refrigerate until ready to use, or place them in a pressure cooker or water bath to seal and make them shelf-stable.